Alain Badiou is former chair of philosophy at École normale supérleure and author of In Praise of Politics. Laurent Joffrin is editor of Libération newspaper—and a reformist who defends existing social democracy. Alain Badiou recently announced that he would stop running his seminar. He also announced that he would soon be publishing The Immanence of Truths, completing a trilogy that also includes Being and Event and Logics of Worlds. This sprightly octogenarian has not stopped publishing: he has recently brought out Je vous sais si nombreux… (with publisher Fayard), la Tradition allemande dans la philosophie (Lignes) and Eloge de la politique [In Praise of Politics] (Flammarion). All this, after having already put his name to Eloge de l’amour[In Praise of Love] in 2009, Eloge du théâtre in 2013, and Eloge des mathématiques two years later. Since 1968 he has never participated in any elections, for he looks scornfully on bourgeois democracies. He remains loyal to the ideal proclaimed to the Maoist groupuscule to which he belonged at that time: the Union des communistes de France marxiste-léniniste, whose papers and leaflets bore the images of Marx, Engels, Lenin, Stalin and Mao. 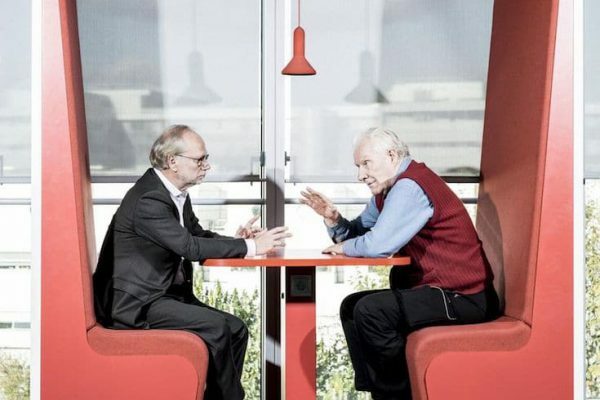 While Libération [which published this debate] must doubtless be classed among the “renegades,” Alain Badiou agreed to a dialogue with [its editor] Laurent Joffrin. For his part, Joffrin takes up a position at the heart of the political game as a commentator and defender of social democracy and reformism. Their exchanges over Eloge de la politique were lively and hard-fought. They exposed the gulf that separates the man who holds firm to the “communist hypothesis” founded on popular insurrection — even if he admits not knowing how it would develop — and the man who is sure to advance step by step. Alain Badiou: Perhaps I should have called my book Eloge d’une politique [i.e. “In praise of a politics”]. Indeed, I see there as being two possible definitions of politics. The first centres the question on the conquest and exercise of state power. Politics is here defined as a realistic management of the demands of power. The second definition — one that arose very early on, especially in Plato — considers that the key problem is the question of justice. I commit to this second definition, and define politics as the whole set of procedures that lead to the organisation of a just society. And that means a society that is freed from the power relations and the inequalities that constitute the collective reality. This debate was already taking place between Aristotle and Plato. The former had a very pragmatic conception. He analysed the economic and financial conditions of societies’ existence, and was concerned that there should exist a middle class. Plato, conversely, first of all tried to define a just society, and only subsequently concerned himself with the means that would be required to get there. Laurent Joffrin: That distinction is fine by me. But in Eloge de la politique you go a lot further than that. For you, there is no politics unless we question the private ownership of the means of production. So, politics only begins when there is a confrontation between two radically different proposals for how society should be organised, with one based on private property and the other on collective appropriation. I do not think that that is right. There is politics within market systems: the question of whether we should go to war in Iraq or not is politics; the question of whether to get rid of ISF [“Solidarity tax on wealth”] or not is politics; voting for Fillon or Hamon is politics. The property question is just one among others. It has now passed onto a secondary level on account of the failure of communism. AB: But that is the central point. The political societies that arose at the moment that states were created around sedentary agriculture, and new techniques of production, communication and warfare, were entirely linked to the division of society into classes. And this division is itself based on the private appropriation of goods that ought to have been considered common. Politics is then a matter of settling the dispute between those who possess and those who do not. Today we are in the last, most perfected form — especially at the technical level — of this millennia-long construction which I call the “neolithic of politics.” Capitalism presents itself as the ultimate outcome of this very long history of organising society around the private appropriation of goods, whose natural destination concerns the collectivity. It results from this that politics today — in the sense of the most elementary justice — supposes a complete change, a systematic transformation. AB: We disagree completely. A politics that does not pose the property question is a politics in the first sense I mentioned, in the sense of administering state power, which itself relies on “bourgeois” property — that property concerning finance, shareholders, industry, the media…Without doubt there are are nuances between a free-marketeer administration and social-liberalism. LJ: You defend the “communist hypothesis.” You make a lot of interventions and you publish books. Why does this “hypothesis” have so little echo? It is because no one wants it. No one wants to repeat the communist experience, which ended up in a historical disaster. AB: I have seen this “socialism” myself: it was my political education, at the moment of the Algerian War, when under the [French Socialist Party] government they were torturing prisoners in the police stations of Paris! LJ: In your book you once again defend the Chinese Cultural Revolution launched by Mao in 1966. I will tell you, I am deeply shocked by what you have to say about it. The Cultural Revolution saw hordes of — mostly uneducated — youth who descended upon the universities, companies and ministries in order to seize hold of intellectuals and officials and parade them in the streets, insulting them and putting placards around their necks describing them as renegades, traitors, or revisionists. They were tried in public squares, beaten to death or dispatched to the Gobi Desert and elsewhere. This was a terrible experience of terror, and you describe it as a necessary, useful episode, bringing the future closer! One example: Song Binbin, a “red princess,” daughter to one of the founders of the People’s Army, took part in lynching the head of her school — even though this latter was also a communist — who died in the early morning after a night of tortures. Song Binbin apologised for this in 1994. It is her who we see in the photos of Mao receiving the Red Guards on Tiananmen Square. The Great Helmsman provided her as an example. AB: What are you calling the ‘Terror’? If you mean the years 1792-94, immediately following the overthrow of the monarchy; if you mean the magnificent Constitution of 1793, which remains without equal up to this day; and if you mean the mobilisation against the foreign invasion, then yes, I say “yes, I defend the Terror.” The Robespierrian sequence was a key period which made the French Revolution something more than a simple constitutional reduction of the King’s powers, like took place in England. LJ: The Revolution itself put an end to the Terror, and it did so against Robespierre, once the external threat had been lifted. The Robespierrians wanted to continue the experiment to bring about the emergence of a “new man,” which is madness. But we can still defend this period by maintaining that in the last analysis, despite everything, it allowed the establishment of a freer society. The society that the Maoist Red Guards advocated was based on terror and oppression. The Chinese today are horrified by it, while for their part the French have adopted the democratic republic. AB: You speak of the Red Guards like you do the rest of the Cultural Revolution, i.e. without knowing anything about it. That much is clear. You speak of a free society, but the category “freedom,” taken in isolation, means nothing. What does the freedom of a man with a business empire have to do with the freedom of those who have nothing? Freedom, in a context of enormous inequalities, is a fallacious concept. AB: Well, for decades, all over the world, we have experience enough to tell us that this much-vaunted “difference” is but an avatar for the conservation of the system. People are starting to find out as much: not many of them voted in the recent farce that enthroned Macron. AB: The existence of a militarised organisation, the single Party, able to seize power and then exercise it alone, is by no means the guarantee that the principles of communism which I have just mentioned will indeed organise the real. We have to reinvent politics: there has to be an entirely new dialectic between mass or movement democracy, our organisations and the state. In what form? We do not know, for there are periods of doubt, moments in history when the question of what means are necessary remains obscure. Before we rush to address the question of the means, we have to begin by re-establishing the legitimacy of the problem, the relevance of the hypothesis. And there we need intellectuals. There are not enough of them today, seeing the ravages left by the 1980s counter-revolution, with its emblematic “Nouveaux Philosophes.” Fortunately, a new youth is now appearing. LJ: So if the majority of “folks” oppose the communist hypothesis, it will not see the light of day? AB: The numerical concept of a “majority” has no political meaning, it corresponds to the emptiness of surveys. But, equally, I have myself long criticised vanguardist notions. The existence of mass movements and a vast favourable public opinion is a necessary condition for the possibility of a new communist political vision securing victories. AB: But what is it that the people “decides”? Etymologically, democracy is the “power of the people.” Yet it is moreover necessary that this power should not be materially appropriated by an oligarchy. And that is the case in capitalism, which you defend.